We run your code in an isolated Java Virtual Machine on our servers. We allow you to specify the scala version, add libraries and much more. By default, we instrument your code to provide a REPL like environment. You can also format your code with scala-fmt. We integrated a scaladex interface to allow you to search the Scala ecosystem and include any published Scala library in your project. You don’t need to remember the latest version of a specific library anymore! Using sbt behind the scenes makes it possible for us to support a large range of platforms (Scalac, Dotty, Scala.js, Scala-Native and Typelevel’s Scala). In our beta, we’ve included support for any version of Scalac as well as all published versions of Dotty. Support for other platforms, such as Scala.js or Scala Native is forthcoming. Basing Scastie on sbt allows us to support newer Scala versions and resolve libraries dependencies. We also enable a worksheet mode, which feels much like a worksheet in an IDE. This lets a user write code as top-level expressions, without having to put code inside of a class or object with a main method. Worksheet mode gives you two ways to interleave your results; on the one hand, when an expression is evaluated, you can see the value and type of the evaluated expression to the right of the code that you wrote. On the other hand, worksheet mode also makes it possible to do a kind of literate programming; that is, you may interleave code and HTML blocks much like in notebook environments like iPython notebooks. And remember, please give us feedback! Let us know what is confusing, if something doesn’t work as expected, or if there’s anything you think we can improve! There are links in Scastie back to our Gitter channels and GitHub issue tracker. Sorry I don’t have a smarter question, but how do you pronounce scastie? The beta is full right now. We have more than 700 users registered with 500 spots open. I’m fixing mirror issues and I will increase the limit to 1000 so more people will have a chance to try it out! Here is a summary of what will be improved shortly: https://github.com/scalacenter/scastie/projects/1?fullscreen=true (V2 Column). Thanks a lot for the feedback, we are really happy with the community reaction for this announcement. 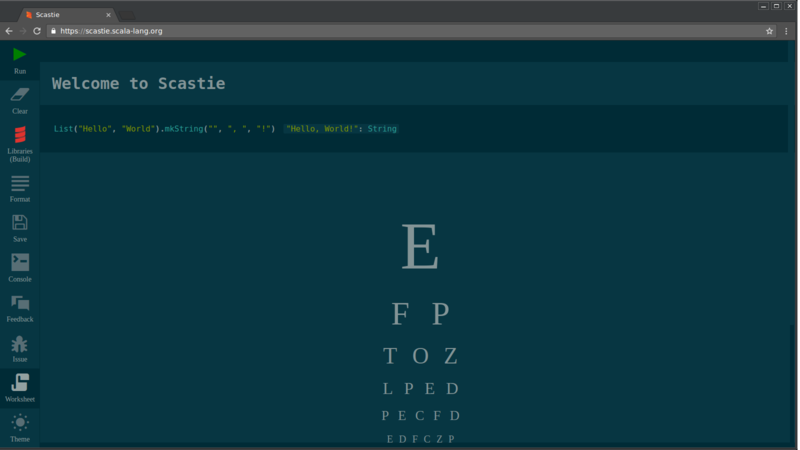 The Scala Center team is extremely happy to announce that Scastie is out of beta! You don’t need to be logged in to GitHub to access the site. We also improved the UI and added support for Scala.js. Check it out! The mobile interface is still not really optimal on my phone, if I may say so. Looks great! Except maybe for a lack of UI clarity for where the editor ends and where the output begins. The library features are really nice. It would be even nicer if the libraries were listed in SBT format so Scastie could be used to easily alter SBT builds instead of having to jump out to ScalaDex. This was covered by tweets, but the scala/center gitter room was missed (I just reposted the blog there). Any other places it should be announced that might have been overlooked? This is really interesting! I’ve been trying it out and would like to include it in my standard workflow, though it isn’t the fastest. Are there plans to publish a self hosting setup guide? There used to be an endpoint at http://www.scalakata.com/api/com/scalakata/Api/eval – is there an equivalent on scastie.scala-lang.org?